Despite being written off by many this season after the loss of Neymar and rivals Real Madrid’s dominance last season, Ernesto Valverde’s Barcelona side came into this game at home to Champions League chasing Sevilla in inspired form. 9 wins from their opening 10 games and Lionel Messi in the form of his life had shut up many critics as they cruised towards their 3rd league title in 4 years with a 4 point lead over 2nd place Valencia and 8 points over bookies’ title favourites Real Madrid in 3rd. This game against the Andalusian club was to be no walk in the park, as has been proven over the years. This season’s Sevilla side, under the stewardship of Eduardo Berrizo, had performed fairly well in the league coming into this fixture; finding themselves within touching distance of the Champions League places. Barcelona began this game on the front foot, as was to be expected, but deployed a slightly different system as the loss of summer signing Ousmane Dembele through injury meant that they were unable to play an optimal 4-3-3. They took the lead on 22 minutes through Paco Alcacer as they dominated possession, albeit with a slightly more direct approach than we are used to seeing from La Blaugrana. Sevilla defended well, restricting Barca to long range efforts and occasional half chances and looked dangerous in transition. Their efforts were rewarded in the 58th minute when Guido Pizarro headed home from a corner. Barca’s lead was restored shortly after though, as former Sevilla man Ivan Rakitic crossed the ball into the path of Paco Alcacer, which proved to be the winner. As mentioned before, Barca would have to do without superstar summer signing Ousmane Dembele on the left of their front three as he was sidelined with a long term injury. The logical solution would appear to be introducing Gerard Deulofeu in his absence, however his unremarkable performances since re-joining his boyhood club meant Valverde was somewhat wary of trusting him in the starting line up.Instead he opted for what appeared to be a diamond with Messi in the number 10 role. It proved highly effective in the midfield zone as Barca did not face the issues with circulation of the ball that would have arisen due to Sevilla’s compact medium block. Messi was undoubtedly Barca’s most influential player in this game, but played a slightly different role than we are accustomed to seeing. Often he was responsible for linking the midfield and the defence by creating opportunities for vertical progression through deeper movement. 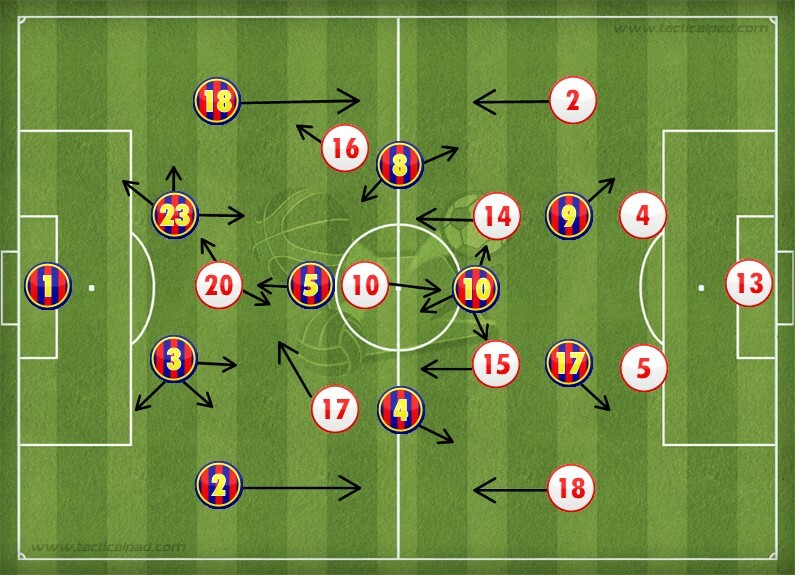 As is seen in the scenario above, he has dropped from his no.10 position into the right half-space to allow Pique to play a 3rd line pass from the back line. 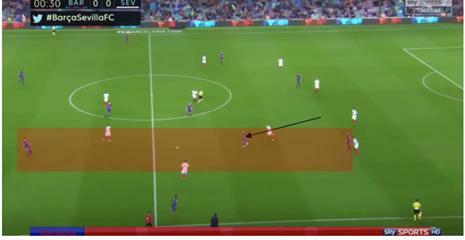 Ideally Barca would have liked to circulate possession through Busquets, however the man orientations of the Sevilla midfielders meant that they were unable to do so in this instance. 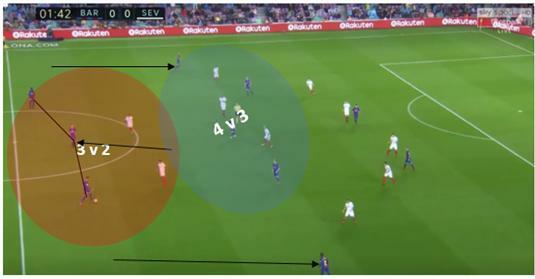 Messi’s movement into deeper positions and sometimes on the same horizontal line as the two 8s, Rakitic and Iniesta was instrumental in disrupting the man marking and defensive organisation of the Sevilla block. With Messi moving deeper to receive possession, the Sevilla 6’s Banega and Pizarro were reluctant to track his movement into such a deep area. 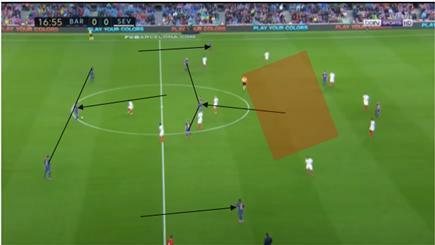 This would not only create a substantial gap in the 10 space for Suarez or Alcacer to move into, but would also mean that they were in a sub-optimal position for an attacking transition as their positions upon regaining possession would be disorganised and random due to the reactive nature of pure man marking. The diamond was essential in creating overloads centrally as we see in this image. Busquets has dropped a line deeper, to facilitate Barca’s progression into the midfield zone. 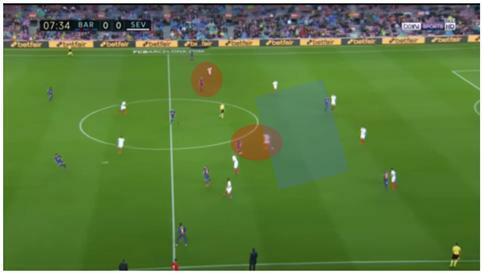 With 3 defenders in the build up against Sevilla’s 2 strikers, Barca would always have the spare man, which would allow the receiver of the ball to have more time and space to pick out a forward pass. This is exactly what has happened in this image with Pique in possession. Should the ball near forward, Muriel, press Pique then it would leave Busquets free and vice versa. This proved effective for Valverde’s side as the free centre back would drive forward with the ball when they lack a vertical passing option. It had its desired effect as it created space for the midfielders by inviting pressure from the Sevilla midfield players. Key to the success of Barca’s diamond also, were the two strikers Alcacer and Suarez whose movement created depth for Barca and stifled the vertical compactness of the Sevilla defensive block. Here, Busquets is in possession and looking to play vertically into midfield. Messi has again dropped into the 8 zone and is looking to receive from Busquets. Should he receive in this position with the Sevilla 6 so tight to him, Messi would be able to turn fairly easily and drive into the 10 space. This is made possible by positioning of the two strikers as the Sevilla back line are unable to move further up the pitch due to the advanced positioning of Suarez and Alcacer. As a result there is somewhat of a disconnect between the midfield an defensive line, making it easier for Messi to drive into the 10 space should he receive and turn. In addition, it is also easier for one of the strikers to drop into this area and receive from the midfielders as the depth is already being created by the other striker. For large periods of the game, the away side kept Barca at bay as they were unable to fashion many clear cut chances. Sevilla did well to maintain compactness as a unit despite their man orientations in midfield, and their medium block was effective in maintaining sufficient distances between the units while also keeping Barca away from their defensive third. They stayed relatively compact in the 1st defensive phase, as the two forwards did not put pressure on the Barca CBs, instead blocking the passing lane of Busquets who was forced to drop onto the same line as the centre backs in order to create overload in the Barca build up. However, their shape was often disrupted by the movements of Messi and Iniesta also, who created space in key midfield areas such as the 10 space. One advantage they did have though, was the defensive overload, as their full backs did not push forward very often during the game as the spaces left open would have been exploited by Suarez or Alcacer in transition. As a result, even when Barca were able to receive possession in front of the back 4, they were unable to take advantage as Sevilla always had the spare man in defence. One area in which they struggled and which ultimately led to Barca opening the scoring, was their pressure in Barca’s build up. The sudden change in approach seemed strange considering that denying Barca space in the midfield area had proven effective in hindering their ability to circulate possession. Instead they opted for a more aggressive press higher up the Barca defensive third, which did nothing but weaken the compactness of their block. This was arguably the root cause of the opening goal by Paco Alcacer. In the image above, Ter Stegen is in possession and comes under pressure from the Sevilla forward. Busquets, just ahead of him, although cover shadowed, is a viable option as the distance between him and the forward is too great for an effective cover shadow. The ball is played to Busquets who is able to receive with a limited amount of pressure and find Iniesta in midfield. The substantial amount of space between the lines allowed him to find Alcacer who slotted past Soria to give Barca the lead. A very evenly matched encounter, but it was Valverde’s men who came out on top to continue their brilliant start to the season and maintain their 4 point lead at the summit of La Liga. Not the best of performances from the current leaders, but a big result against one of the league’s better sides. Having proven many of the critics wrong, Barca will be confident in the belief that they can regain the title from bitter rivals Real this May.